Prototype: German Federal Railroad (DB) class 150 heavy freight locomotive. The largest type of the standard design electric locomotives from the new construction program of the Fifties. Modernized version with double lamps, without a rain gutter, with Klatte cooling vents, in the ocean blue / beige paint scheme. Model: Era IV. The locomotive frame and body are die-cast metal. The locomotive has a 21-pin digital connector. The locomotive has a motor with a bell-shaped armature and a flywheel, centrally mounted. 4 axles powered through cardan shafts. Traction tires. The headlights are maintenance-free warm white LEDs and the marker lights are maintenance-free red LEDs. They will work in conventional operation and can be controlled digitally. The locomotive has separately applied metal grab irons. The engineer's cabs and the engine room have interior details in relief. The locomotive has NEM coupler pockets. Length over the buffers 224 mm / 8-13/16. The German Federal Railroad's new construction electric locomotive program at the beginning of the Fifties also envisioned a heavy freight locomotive in the E 50, which was intended as a replacement for the E 94. The E 50 was designed first for heavy freight service on steeply graded routes; hence, it was supposed to provide performance that exceeded all electric locomotives previously built in Germany. Embedded in the total program of development for the new standard design electric locomotives, the lead management for the E 50 was given to the consortium of Krupp/AEG. The nominal power at 80 km/h / 50 mph was 4,500 kilowatts / 6,035 horsepower; the continuous power at 70 km/h / 44 mph was 4,218 kilowatts / 5,656 horsepower. 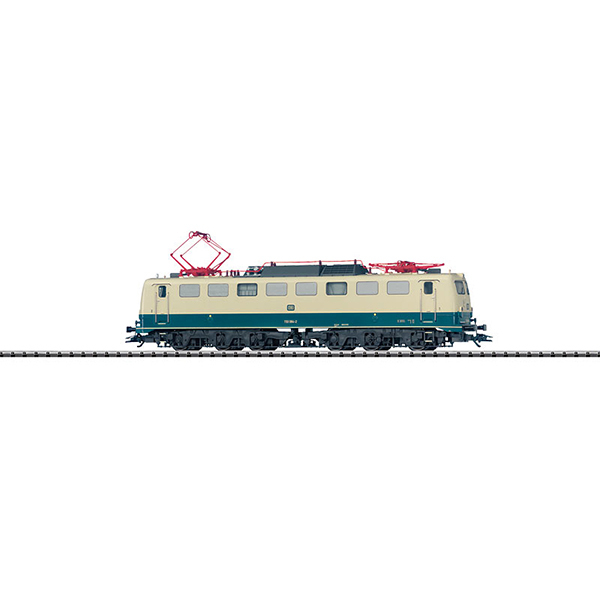 With a view to the future, the E 50 was already designed for a maximum speed of 100 km/h / 63 mph, which could not be used to advantage for a long time in freight service because of older freight cars not suitable for such speeds. The higher performance requirements could only be achieved with appropriately larger designs of the essential components compared to the components for the other standard design electric locomotives. The transformer and the blower motors in particular required more room in the E 50. Three-axle trucks (C-C wheel arrangement) had to be installed so the axle load of 21 metric tons was not exceeded. The long trucks meant that the frame for the body had to be longer, so that the E 50 was about 3 meters / approximately 10 feet longer than the E 10/E 40. The first units were placed into service beginning in April of 1957; the last E 50 locomotive was placed into service in July of 1973. A total of 194 locomotives were built. As with the other standard design electric locomotives, the E 50 (designated as the class 150 starting January 1, 1968) underwent numerous structural changes and improvements. The most noticeable changes externally were the removal of the rain gutters, the handrails on the ends with grate-style footrests, as well as the equipping of the locomotives with the Klatte design ventilation grills. The technical progress on the E 50/150 did not stop at the turn of the century with the class 152 and 185 electric locomotives being placed into service. In 2003, the last of the class 150 was taken out of service. Only two units remain preserved as museum locomotives for future generations.